It’s early morning at the Chengdu Research Base of Giant Panda Breeding on Futou Mountain, part of the rare bears’ ancestral homeland. A small group of us are huddled against a wooden fence. We’re hoping to glimpse some of the giant pandas that have been bred and raised in this sprawling habitat of laurel trees (both real and artificial) and bamboo forest. The capital of Sichuan province in southwest China, Chengdu is home to 16 million people. (With 24 million residents, Shanghai is the country’s largest city.) But it’s probably best known for the 150 black-and-white bears living at the research base. Although the base and its park are just 10 kilometres north of downtown, they’re an otherworldly escape from the city’s snarled traffic and modern skyscrapers—architectural eye candy when not hidden by haze. 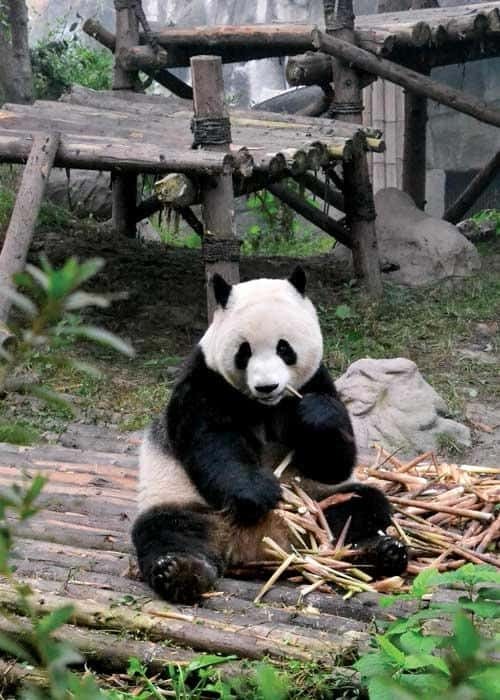 Chengdu’s ancient alleyways and lush surrounding forests served as inspiration for DreamWorks Animation SKG Inc.’s Kung Fu Panda films. Art and life imitate one another in this deep-rooted but forward-thinking city, which is laying the groundwork for its lofty goal of becoming Asia’s Silicon Valley. Courtesy of Janet GyenesTwo portly pandas lumber to a bamboo platform. One plops down on its plush backside, grabs a bamboo stalk from a pile and starts chomping away. It’s like an animated character programmed to chew in perpetual motion, more Zen master than kung fu fighter. 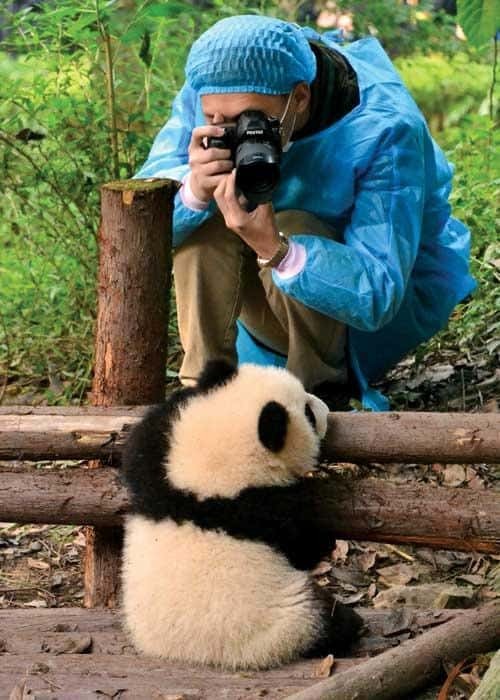 We wander to another panda den just as a park staff member—clad in a lab coat, rubber boots, hairnet and face mask—is depositing three cubs on a platform in a furry heap. 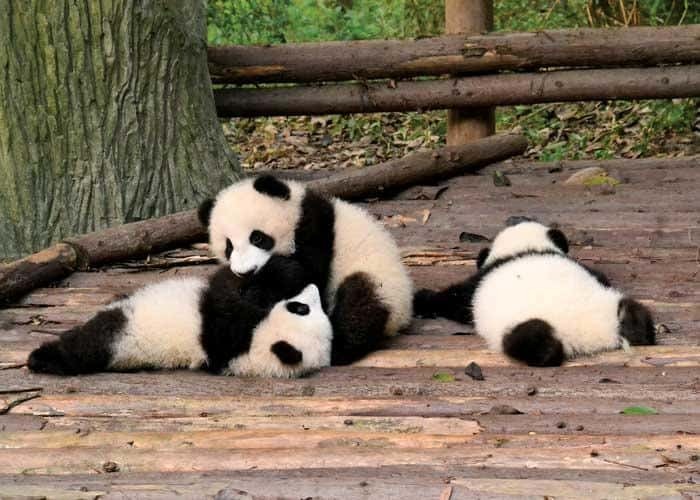 Watching these animals romp is a meditative experience, but there’s more incubating in Chengdu than pandas. Although the city is overshadowed by business behemoths Beijing and Shanghai, almost 280 Fortune 500 companies already operate here, according to the Chengdu Municipal Government. Growth has been brisk and big. The supersize New Century Global Center, whose 1.7 million square metres make it the world’s largest building by floor area, opened in 2013. Under the steel structure’s wavy roof trimmed with glowing purple lights are myriad offices, the new five-star Inter­Continental Chengdu Global Center hotel and a shopping mall with 3,200 stores. 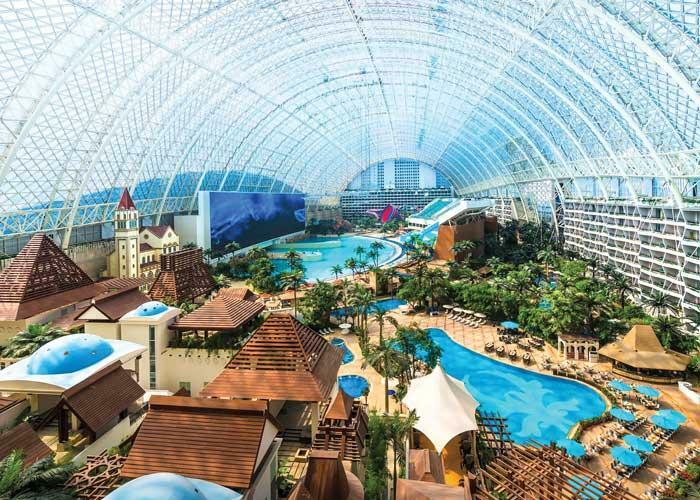 It all wraps around the Paradise Island Waterpark, which has an artificial beach where the surf’s up and the sun shines 24/7. This colossus sits at the core of the Tianfu New Area, a 1,578-square-kilometre modern metropolis in the making, whose amenities will include a high-tech hub. Manufacturing is still a mainstay for Chengdu, but the city is attracting new investment by offering government incentives for innovators and venture capitalists. Chengdu’s California dreams are taking shape. 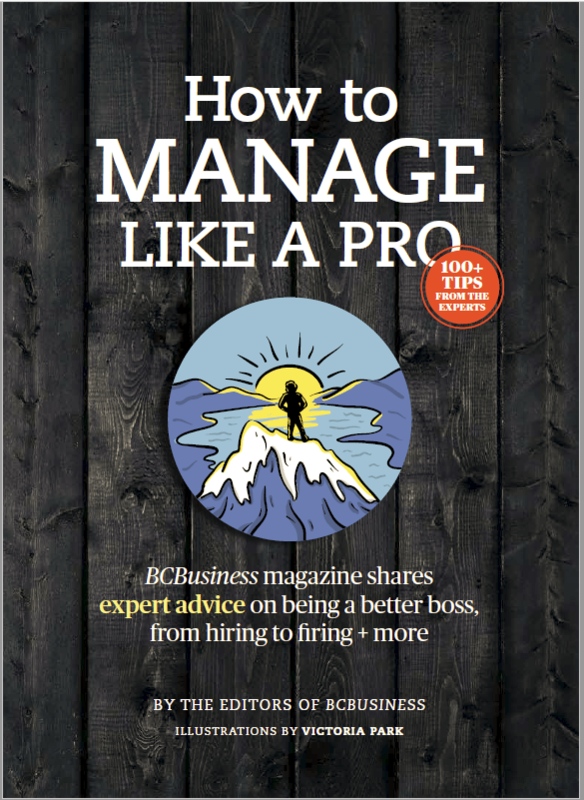 At its first so-called fireside chat last December, Startup Grind Chengdu, a new chapter of the global community conceived in Silicon Valley in 2010, hosted more than 100 entrepreneurs and investors. Since then, the monthly events have featured companies such as Australia’s Euclideon Pty Ltd., which claims that its hologram technology will eclipse virtual reality in the gaming universe. It’s too soon to tell whether Chengdu is primed to be a breeding ground for Chinese unicorns like e-commerce giant Alibaba Group Holding Ltd. and smartphone maker Xiaomi Inc. But it will always have its rock stars, the giant pandas. Chengdu is the birthplace of Sichuan opera, whose folkloric acts have been performed in its teahouses since the 16th century. 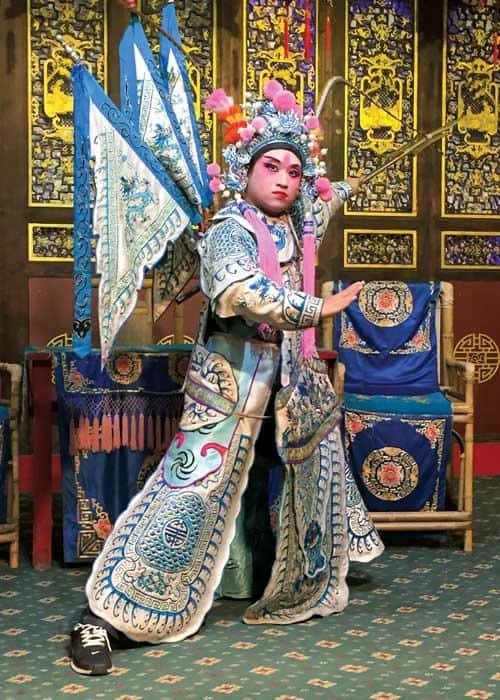 Forget what you know about classic Italian operas; the Sichuan version at Shufeng Yayun Teahouse is like a Chinese variety show, with shadow puppetry, singing and dancing, acrobats and fire breathing. The classic hotpot with lip-numbing (yet not always fiery) Sichuan peppercorns is a staple in Chengdu. 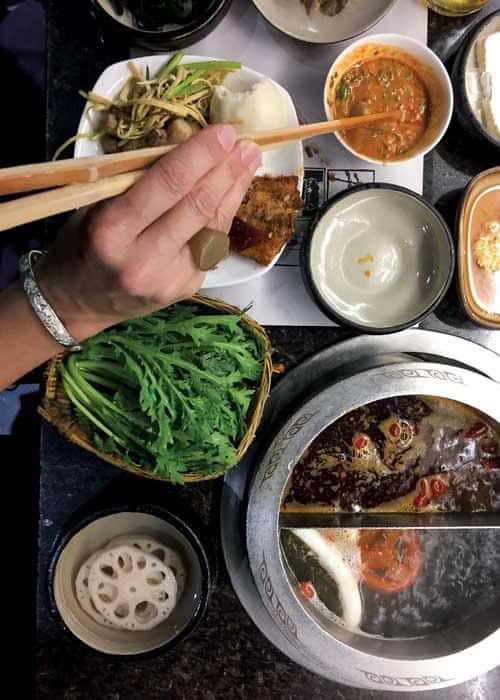 At Huangcheng Laoma, a chain of Chinese hotpot restaurants founded in Chengdu, bowls of fish heads, lotus root, pork balls and other raw delicacies roll by on a gleaming conveyer belt. Grab a few items to cook in your personal hotpot of bubbling peppercorn-spiced oil, then dip them in sauces made with garlic and peanuts. Traces of ancient Chengdu can be found in the renovated Kuan Xiangzi (Wide Alley) and Zhai Xiangzi (Narrow Alley) as well as Jinli Old Street (below), Courtesy of Wikipedia Commons where vendors have been selling goods since the Qin Dynasty (221 to 206 BC). 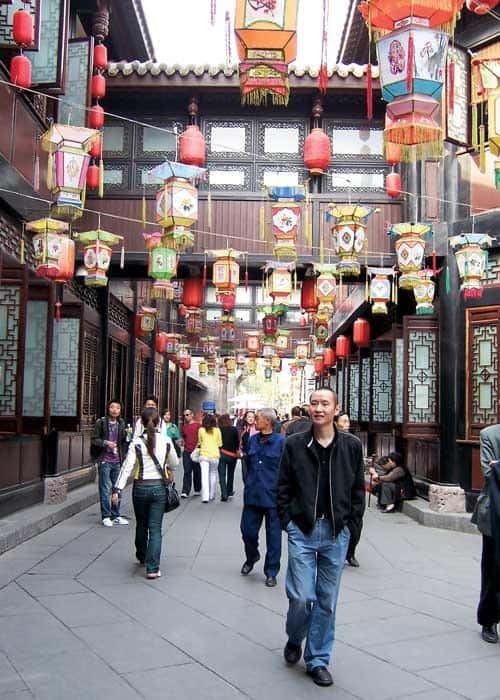 Both areas are crowded, yet there’s an easygoing vibe, with quiet courtyards, characteristic red paper lanterns and lively entertainment such as puppet shows. Shop for jade jewelry, clothing made from silk brocade and panda-themed souvenirs. Stop to sip chrysanthemum tea, duck into a bar for a beer or sample snacks such as sugar candies studded with flowers—or, if you’re adventurous, whole deep-fried birds that fit in the palm of your hand. Find tranquility and tradition on the paths and shaded parks alongside Chengdu’s narrow rivers. Wander to Chengdu Renmin Park (People’s Park) to watch locals playing mah-jong or practising their morning ritual, tai chi.